We’re not just vendors. We are partners. TRIAD Technologies (TTech) offers comprehensive technological solutions in Channel and Trade marketing domain. We provide customized and feature-rich solutions for all levels of channel marketing be it at the points of distribution (multi-layered / tiered) or the last mile connect of the In-Store Demonstrator or Sales Promoter. We derive our expertise from our 8 years’ of experience of managing various Channel and Trade marketing initiatives. All the founders of TTech worked for TRIAD Marketing Services, which specialized in Trade Marketing program management, claim management, promoter or partner incentive programs, etc. Closely aligned with the sales functions, we bring in elements of trade marketing and technology to solve the real last mile ‘sales’ challenges. Our tailored technological solutions empower channel-led businesses and their sales teams to focus on sales rather than challenges. 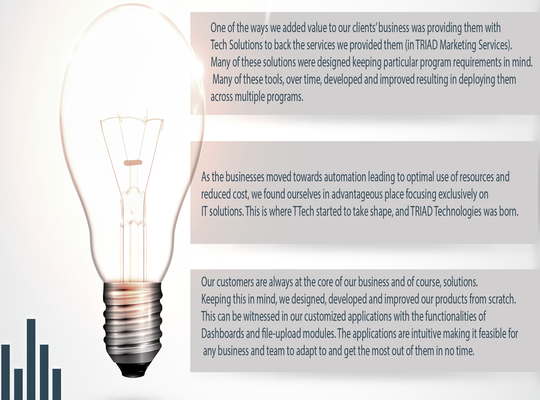 One of the ways we added value to our clients’ business was providing them with Tech Solutions to back the services we provided them (in TRIAD Marketing Services). Many of these solutions were designed keeping particular program requirements in mind. Many of these tools, over time, developed and improved resulting in deploying them across multiple programs. As the businesses moved towards automation leading to optimal use of resources and reduced cost, we found ourselves in advantageous place focusing exclusively on IT solutions. This is where TTech started to take shape, and TRIAD Technologies was born. Our credo is that in our heart of heart we are ‘sales’ people. We understand partners’ challenges and pains. Another credo is that we are street-smart which comes from the fact that we are pragmatic in our approach while developing solutions. Another thing about our creed is that we take a lot of pride in being dependable.